Dear Readers, there is a special pleasure when you witness something in your garden that you have previously only read about in books, or seen on TV. So it was with me last week. 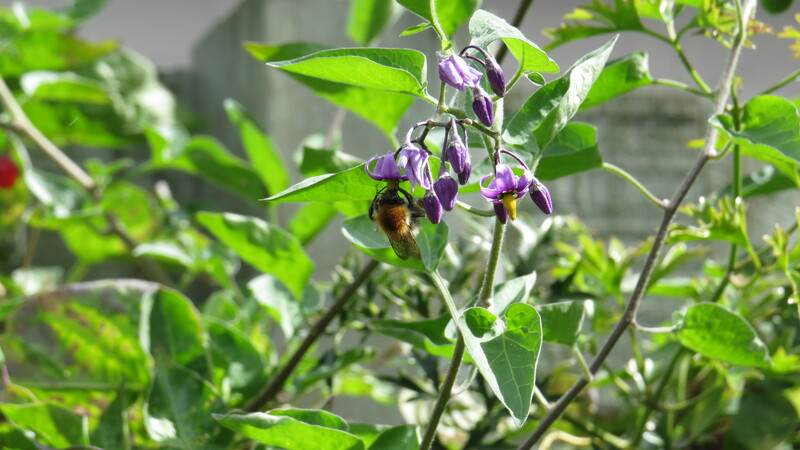 I’ve been away a lot during the past few months, and had only just noticed that, among my clematis and honeysuckle, a vigorous bittersweet plant had grown up. I’ve written about this member of the tomato family before, but hadn’t had the pleasure of spending any time with it at home. I think it’s rather attractive, and its berries are splendid. I rarely have small visitors who might be tempted to eat them, and so I’ve decided to leave them and see what the birds make of them. 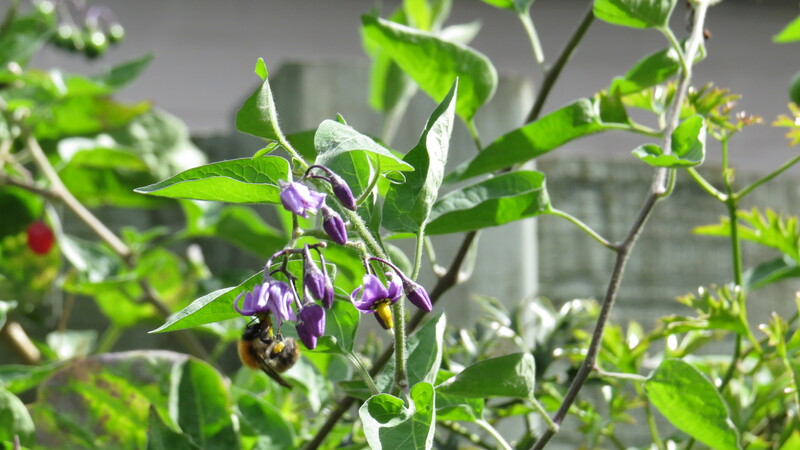 On a warm afternoon last week, I noticed a high-pitched buzzing sound coming from the bittersweet. Half a dozen common carder bees were feeding from the purple and yellow flowers. These are among our most widespread and common bumblebees, little ginger insects that lack the handsome warning stripes of other members of their family. They always strike me as particularly single-minded creatures, unlikely to be deterred by middle-aged ladies with cameras sneaking up on them. My question was, why are they all over the bittersweet? 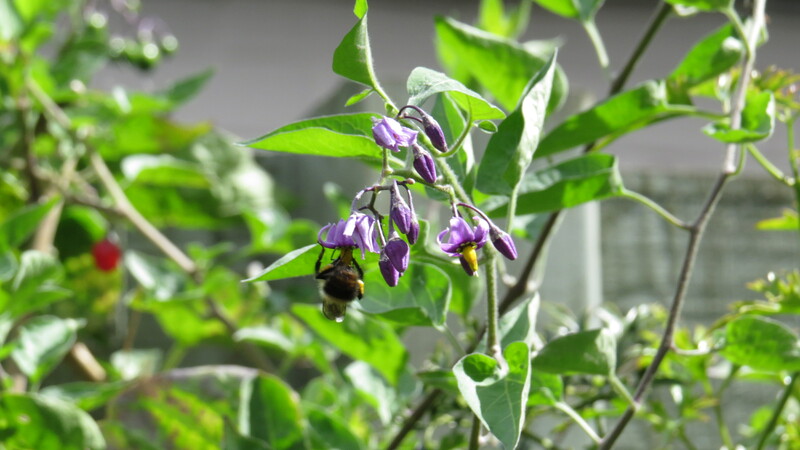 There were much more splendid nectar sources about, and common carders are ‘long-tongued’ bumblebees, which means that they can extract nourishment from many kinds of flowers. Nonetheless, they ignored the honeysuckle. 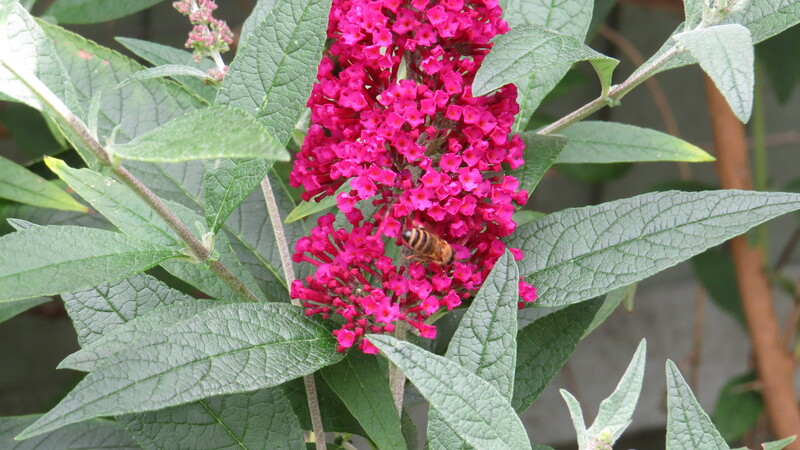 They ignored the dwarf buddleia (though the honeybees were enjoying it). No, all they wanted was the bittersweet, and it seemed that what they wanted was the pollen. Bees collect nectar for energy, but pollen has the protein that enables young bees to build strong muscles and wings. The trouble is, the pollen in all members of the Solanaceae (as I mentioned in my post on tomatoes earlier in the week) is hidden inside the anther, the long yellow cone in the centre of the flower. In his book ‘A Sting in the Tale’, Dave Goulson describes this structure as ‘an inverted pepper pot’ that needs to be shaken to release the pollen. And this is what the bees were doing. They grasped the yellow cone with their jaws, and madly vibrated their wings, collecting the pollen as it dropped out. This is known as ‘buzz-pollination’ or ‘sonicating’ and only some bee species have learned how to do it. Bumblebees are often thought of as the Einsteins of the bee world, and so it’s no surprise to me that they should have picked up this skill. Here is a common carder bee in action. Sadly, I don’t think my camera microphone is sensitive enough to have picked up the buzzing, but do go and observe any tomato plants or other solanums that you have. You can see how the special hairs on the bee’s legs are packed with food – this species mixes the pollen with nectar to make a slightly wetter substance that is easier to transport. Of course, as the bee moves from flower to flower, she cross-pollinates the plant. There were so many common carders that I wondered if they had a nest nearby, maybe even in the garden. It’s known that the species will fly up to 450 metres from its nest site, which is a lot bigger than my plot, but still implies that the nest is somewhere in the County Roads here in East Finchley. All bees have to balance the energy required to find food (flying is an exhausting business) with the quality and amount of food found, and so a small bee like a carder is likely to have a smaller range. 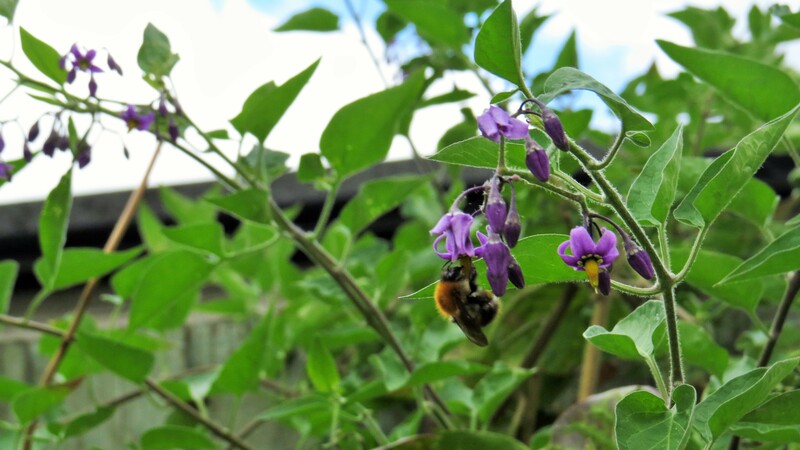 It just points up the importance of having nectar and pollen-rich flowers in the garden – you never know when a bee who is running out of fuel will be rescued by your plants. What would a common carder nest look like? 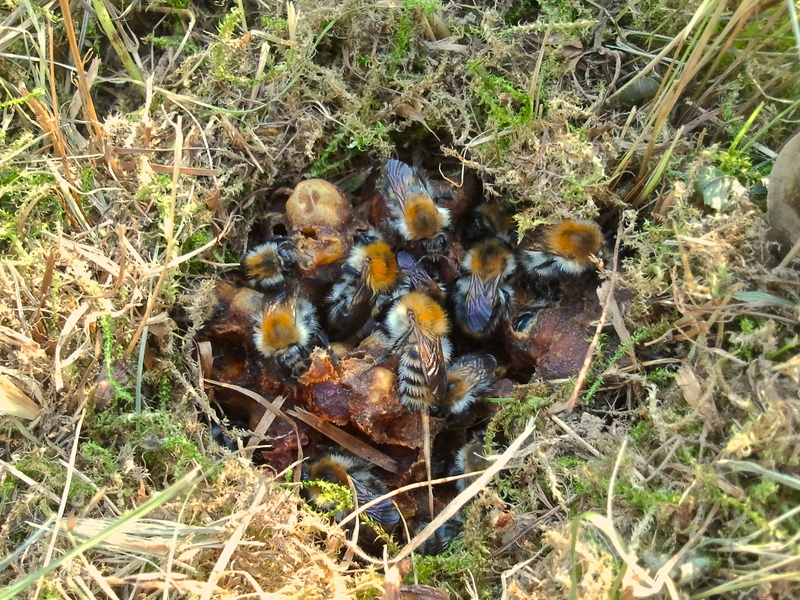 ‘Carder’ bumblebees are so-called because they comb (‘card’) together moss and grass to form a covering for the nest, which is usually hidden under a hedge, in long grass or just below the soil surface. 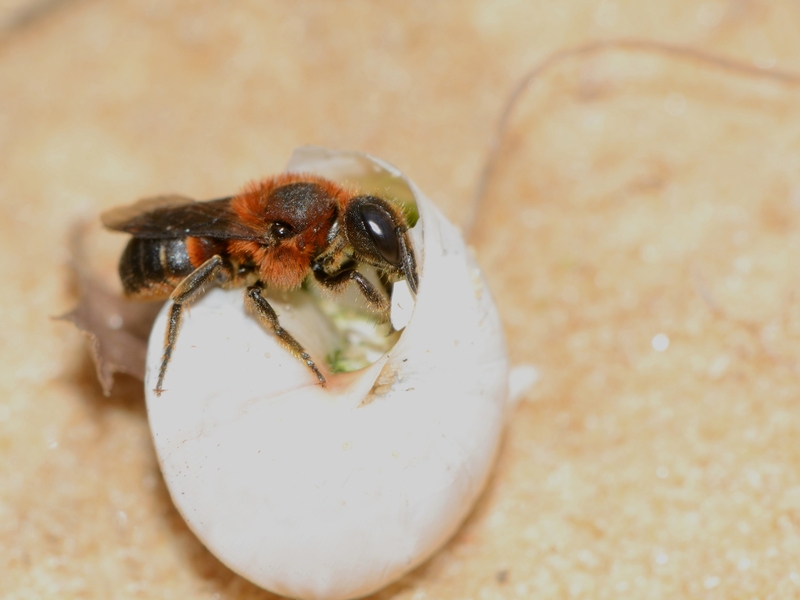 In this, they differ from other, larger bees who use the vacated homes of small rodents – a study showed that if you sprayed some tunnels in the earth with ‘essence of mouse’ the bumblebees were much more likely to set up their nest. In the photo below, the moss has been gently pushed to one side to reveal the goings on below. All bumblebee nests look much more haphazard than the perfect hexagonal cells of honeybees, but they are also much smaller – a common carder nest will have up to 200 individuals, as opposed to the thousands in a honeybee nest. Incidentally, bumblebees do also make honey, which is kept as a short-term food store in case of bad weather. There is no need to make the quantity that honeybees do, as the nest does not survive from one year to the next. In a complete digression, I discovered that one tiny UK bee, Osmia bicolour, makes her nest in an empty snail shell. I can’t find a photo of the British species doing this, but here is a close relative, Osmia ihotellerei, sorting out her new house. I should enjoy the visits of the common carders while I can, however. The worker bees and drones and the original queen will be dying, the nest falling into disrepair, as winter approaches – ,most nests are finished by September. Many of the bees visiting my bittersweet will be young queens, feeding up before they go into hibernation. You might see them patrolling areas of rough ground, looking for a good site to crawl into until spring, when the whole cycle begins again. Until then, I shall be watching my bittersweet with interest, and thanking it for enabling me to see this fascinating behaviour in my own back garden. It just makes me curious about what other wonders are happening every day, unnoticed. This entry was posted in London Invertebrates, London Plants on August 26, 2017 by Bug Woman. 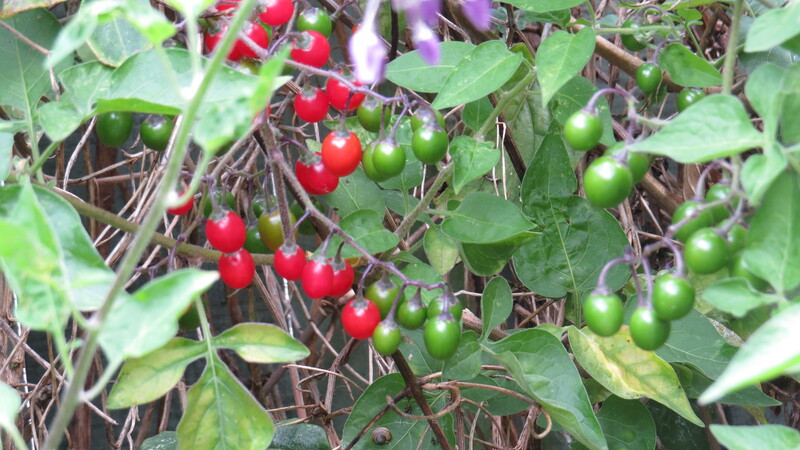 This is the plant I have always called Deadly Nightshade. Am I wrong? Thanks! Saved from a lifetime of ignorance. There now, I thought this it might be Nightshade, as well as Sarah. Thank you again. I am loving the Dave Goulson book so thank you for that too! 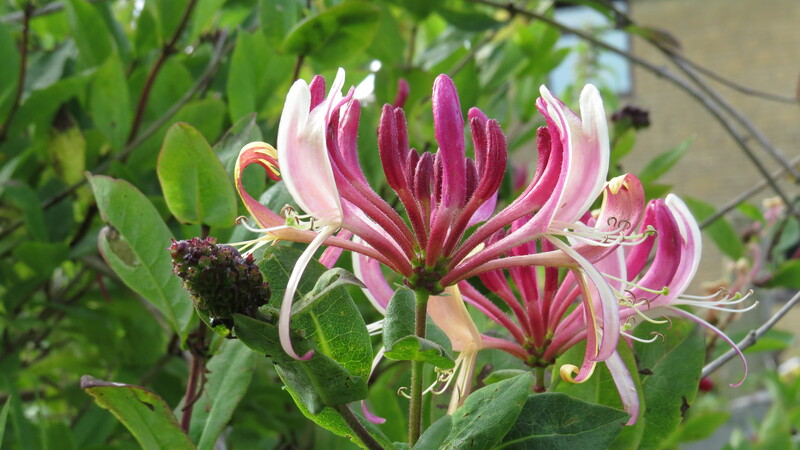 I think it’s a very easy mistake to make – same family, same kind of flowers, scary red berries. 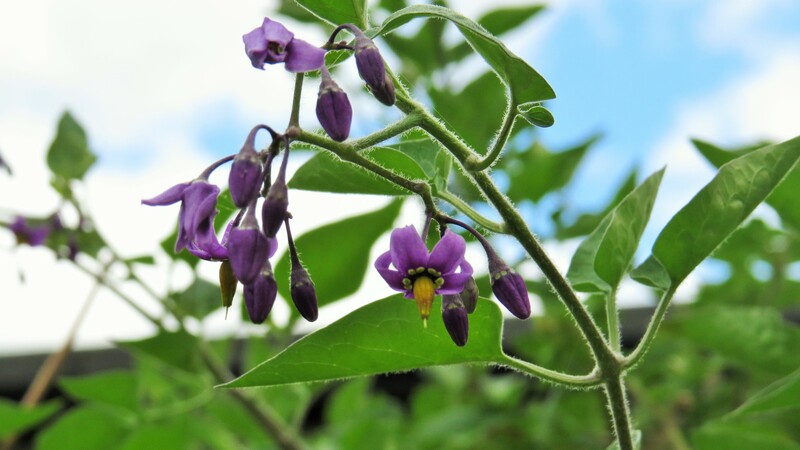 One way to remember is that the berries of Deadly Nightshade are black as pitch. So glad you’re enjoying Dave Goulson, he writes so well, and is so interesting….he’s one of my heroes! This is fascinating Vivienne, a while ago I discovered a single small bittersweet plant in a piece of ground next to a road, but I’ve never looked out for this behaviour – I will in future.